Elements Theatre Celebrates The Bard With "A Midsummer Night’s Dream"
With "A Midsummer Night’s Dream"
Set in modern-day Central Park, this comedy of love in its many guises brings together star-crossed lovers, quarreling kings and queens, mischievous fairy sprites and a ragtag troupe of traveling players, all caught under the summer moon’s intoxicating spell. As romance and ambitions of grandeur run rampant, it becomes difficult to tell the difference between the lovers, the lost souls and the fools. 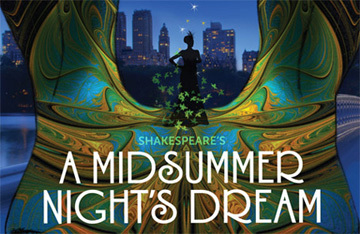 The inspiration for numerous adaptations, including Ingmar Bergman’s “Smiles of a Summer Night,” Stephen Sondheim’s “A Little Night Music,” and a star-studded 1999 feature film with Kevin Kline and Michelle Pfeiffer, "A Midsummer Night’s Dream" provides an ideal escape for a warm summer’s eve.